In May 1999, I took architecture/sculpture course titled “Idiosyncratic Apparatus” (Sue Reese and Donald Sherifkin). 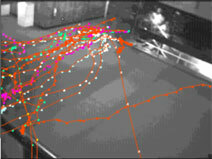 I was interested in visualizing the paths traced out by individuals as they moved through spaces. I wanted to make the architectural concept of the “program of circulation” concrete and measurable. I was also curious what might be revealed about the social psychology of individual interaction if there was a methodology for precisely recording the positions and velocities of individuals in relation to each-other and the environment they were moving through.